It looks like he's taking a drink out of that pine cone! Again - what a beautiful setting to photograph the Crossbill in! Nice Capture of the Crosbill. They have a really cool built in foraging tool kit. Nick, you never cease to amaze me with the photos you get! Thanks everyone. I wish I could fill the frame with these birds but they are always so high up. Every picture I've taken of one is quite a big crop. 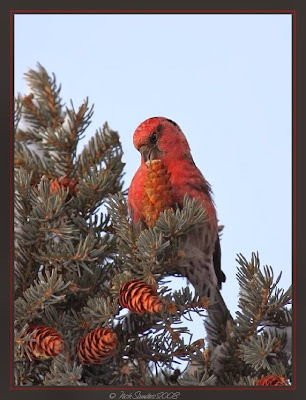 ANOTHER White winged crossbill. I wish I could just see one. They are few and far between on my sighting list. Great pictures. I hope the Chipper stays for your count. It must really be mixed up. You're getting quite a Christmas card collection. Lovely. Very nice shot showing feeding activity - so many birds like to feed at the ends of the pine cones!